One of the most common questions I get is, “How do I know which tickets to buy? Which tickets will make money?” It’s a good question, and one that took me months to figure out how to answer. I mean, it seems impossible to tell at first. Will fans really be amped up for that upcoming Michael Buble tour? Will they be willing to spend more than $300 on a pair of seats in the Floor? What if the seats are in the 13th row? What if they’re off to the side? The questions are endless, and to someone just starting to sell tickets on eBay and StubHub, the whole thing can seem really intimidating. But there’s a very simple way to check and see if your tickets will sell for more than you bought them for. Although it’s not totally fool-proof (nothing in this business is), it’s the absolute most reliable method of finding out if your tickets will make you money. If you’re at the Ticketmaster purchase window about to click “Confirm,” and you’re wondering if your tickets will sell for profit, it’s already too late. You need to know all the necessary details of an event before tickets even go on sale. You might be asking, “How can I know how much tickets will sell for before those tickets have even been released?” Well, sometimes you can. Let’s say you’re signed up to receive all the latest free presale passwords via email and you’re informed that Linkin Park is scheduled to have a show on Saturday, February 19, 2012 at the MGM Grand in Las Vegas, NV. You know that Linkin Park is a big name band and so you’re interested in buying concert tickets to that show. 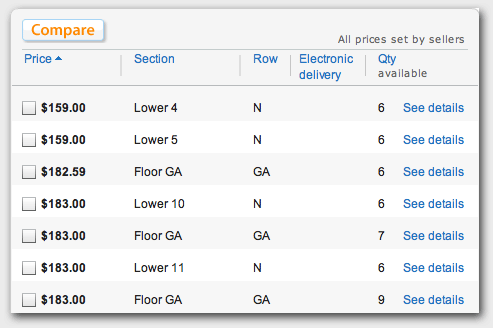 Right off the bat, you can see that General Admission tickets are selling for about $180 apiece. What I always do is run that number through my sales spreadsheet (the same one that comes with my ticket broker eBook). If we assume that GA tickets are going to sell for $75 each (including fees) and that we could sell them for $180 each, we’d know that we’d stand to profit $156 from selling a pair of these tickets on StubHub. 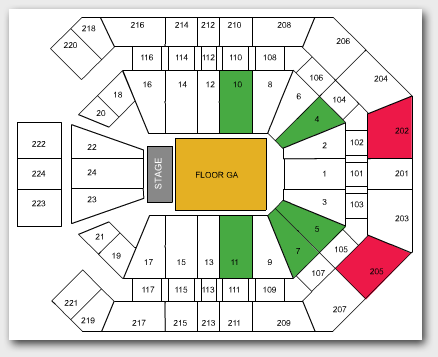 You’ll see that no one is selling tickets for the elevated sections closest to the stage: Sections 14 and 15. Getting seats in the first few rows of those two sections will bring you tons of profits. This isn’t something you could tell by looking at the picture; I just know through experience that those seats tend to yield the highest ROI (Return On Investment). Why is this important? Because this show may be one of the cases where you don’t want to choose Ticketmaster’s Best Available option when tickets go on sale. 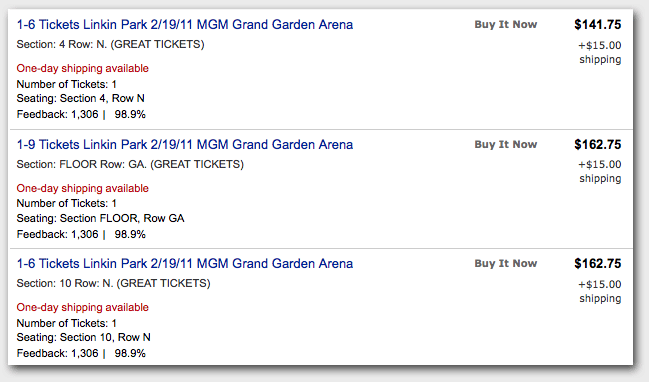 Ticketmaster will return the best available tickets with regards to Ticketmaster price but for a ticket broker, the best available tickets are the tickets that yield the highest eBay/StubHub price minus Ticketmaster price. Sell Price for the – Price). In this case, it may be those elevated sections. I say “may” because you just don’t know for sure. Even if they are the greatest ROI, there’s no guarantee you’ll get tickets within the first few rows, or even get tickets in those sections, period. Pulling General Admission seats is a more reliable method of pulling because there are simply more GA seats to distribute, raising your chances of pulling a pair. In these cases, it’s your call. Do you want to go for the surer bet, or the high risk/high reward? In time, you’ll begin to develop your own selling strategy. If you ask me, I’d still go for the GA tickets. But that’s me. If I know I can make $150+ on a pair of tickets, I’m not taking a risk with anything else. I’m a very conservative broker, but you may not be, and that’s OK, too. Just by doing this one simple check, you know that you can price your tickets for $162.74 and still be the cheapest deal on eBay for these tickets. Selling your tickets for that amount will net you a profit of $153. The profit is so similar because eBay’s Final Value Fees are lower than StubHub, which makes up for StubHub’s higher sale price. In reality, the situation isn’t quite as simple as I just explained. At the time of this writing, those tickets are still a month away from going on sale. A lot can change in a month. The price for those GA tickets will almost certainly go down quite a bit, and you’re going to want to do one last check the day of the on-sale. You want the most up-to-date information possible when it comes to ticket research. If you notice that prices for those GA seats go down to $99 a pop by the time tickets actually go on sale, don’t be surprised. It happens all the time, especially with GA tickets where sellers form bidding wars of their own. As a general rule of thumb, I try to never buy tickets unless they’re being sold for $50 more than what they cost on the day I buy them. $50 is a good number to use here because it covers fees and general misfortunes that will happen to spring up when you least expect them. If they’re selling for $50 more than what I paid, I’m buying. But even then, nothing is guaranteed. This is the method I use to decide whether I want to pull the trigger on tickets or not, and with enough practice, you’ll begin to see that it is the best way to keep your profits high and your losses to a minimum. Your site is very informative and I really think I will give this a shot. One thing I did wonder is how long on average does it take to sell the tickets. I mean I see the stuff about presales but do they sell usually as soon as they become on sale to the general public? Typically, you should be able to sell your tickets within a few weeks of buying them. Sometimes this won’t be the case, but usually it is. I try to sell my tickets within a few DAYS of buying them. I’ve found this to be the most profitable and manageable way to sell tickets online. Where can I found out if an act has sold out previous shows on the current tour? I bought tickets for a opening day for a baseball team before they go on sale to the general public. When is the best time to sell them? Now? The day of the general sale, day after? They tickets are in high demand and will definitely sell out, I am just trying to figure out timing to maximize profits. Buying and selling tickets is something I have been planning on trying for a while now. I obviously have a lot of questions and this site provides a lot of answers and useable information. Thanks! my question is, if you purchase pre-sale tickets and when you print the actual ticket, and it clearly states on there, “THIS TICKET CANNOT BE RE-SOLD” does that mean that the person who purchased the tickets HAS to use at least one of the seats? Can someone enlighten me on how to properly give the tickets once they are purchased? Do you just save the PDF from the electronic delivery and then send that PDF to the buyer? will be sure to bookmark your blog and will eventually come back in the future. as its name says. Play by the rules and it can be a great way to increase income or even begin a new career. before. So nice to discover someone with some original thoughts on this topic. Oferty on sprzedawane wszelkie prywatne jachty jak do Ciebie? That would be the finish of this write-up. Here youll uncover some web sites that we think youll enjoy, just click the links. We like to honor numerous other net web pages around the web, even though they arent linked to us, by linking to them. Beneath are some webpages really worth checking out. We like to honor quite a few other world-wide-web websites around the net, even if they arent linked to us, by linking to them. Underneath are some webpages really worth checking out. We like to honor quite a few other net websites around the net, even when they arent linked to us, by linking to them. Under are some webpages really worth checking out. That would be the finish of this write-up. Here youll find some web pages that we assume youll value, just click the hyperlinks. That could be the finish of this article. Right here youll find some websites that we think youll enjoy, just click the hyperlinks. Below youll discover the link to some websites that we consider you should visit. We prefer to honor lots of other online web-sites on the net, even when they arent linked to us, by linking to them. Underneath are some webpages really worth checking out. Always a huge fan of linking to bloggers that I like but dont get a whole lot of link like from. We prefer to honor numerous other online sites on the net, even when they arent linked to us, by linking to them. Beneath are some webpages really worth checking out. That would be the end of this post. Right here youll discover some internet sites that we feel you will appreciate, just click the links. Below youll obtain the link to some internet sites that we believe you should visit. That will be the finish of this write-up. Here youll locate some internet sites that we consider youll appreciate, just click the links. That is the end of this report. Right here youll discover some websites that we feel you will value, just click the links. Always a massive fan of linking to bloggers that I adore but dont get lots of link like from. Below youll locate the link to some internet sites that we think you’ll want to visit. We like to honor lots of other web web sites on the web, even if they arent linked to us, by linking to them. Below are some webpages worth checking out. That will be the finish of this article. Here youll find some web pages that we think you will value, just click the links. Always a large fan of linking to bloggers that I really like but dont get quite a bit of link love from. Below youll find the link to some web pages that we think you should visit. We prefer to honor several other world-wide-web websites on the internet, even when they arent linked to us, by linking to them. Beneath are some webpages really worth checking out. We prefer to honor several other net web pages around the internet, even though they arent linked to us, by linking to them. Underneath are some webpages worth checking out. That would be the end of this post. Right here youll come across some web sites that we think you will appreciate, just click the hyperlinks. That will be the finish of this report. Here youll come across some sites that we assume you will appreciate, just click the links. That could be the end of this post. Right here youll uncover some web pages that we believe youll enjoy, just click the hyperlinks. That could be the end of this article. Right here you will find some internet sites that we feel youll enjoy, just click the hyperlinks. That would be the finish of this article. Right here youll locate some web pages that we feel youll appreciate, just click the hyperlinks. Below youll uncover the link to some web sites that we think you should visit. We prefer to honor lots of other net web-sites on the web, even when they arent linked to us, by linking to them. Below are some webpages worth checking out. That may be the end of this write-up. Right here youll obtain some websites that we think you will value, just click the hyperlinks. Below youll uncover the link to some web-sites that we consider you ought to visit. Below youll find the link to some sites that we think you must visit. We prefer to honor numerous other web web pages around the internet, even though they arent linked to us, by linking to them. Underneath are some webpages really worth checking out. Always a large fan of linking to bloggers that I appreciate but dont get a lot of link like from. That may be the finish of this article. Right here youll uncover some web pages that we believe you will enjoy, just click the hyperlinks. That will be the finish of this post. Right here you will find some web-sites that we consider youll value, just click the hyperlinks. Below youll find the link to some internet sites that we consider you should visit. We like to honor lots of other internet websites on the net, even when they arent linked to us, by linking to them. Beneath are some webpages worth checking out. Always a big fan of linking to bloggers that I love but dont get a lot of link really like from. That could be the end of this post. Right here you will obtain some sites that we believe youll value, just click the hyperlinks. That will be the end of this report. Right here youll find some websites that we consider you will enjoy, just click the links. That could be the end of this article. Right here you will discover some internet sites that we consider youll value, just click the hyperlinks. We prefer to honor a lot of other net web pages on the net, even when they arent linked to us, by linking to them. Beneath are some webpages really worth checking out. We prefer to honor lots of other net sites around the net, even though they arent linked to us, by linking to them. Underneath are some webpages worth checking out. We like to honor numerous other web internet sites on the web, even if they arent linked to us, by linking to them. Beneath are some webpages really worth checking out. We prefer to honor many other web web pages around the net, even if they arent linked to us, by linking to them. Beneath are some webpages really worth checking out. We prefer to honor lots of other world-wide-web web-sites on the internet, even if they arent linked to us, by linking to them. Beneath are some webpages really worth checking out. That is the finish of this post. Here you will find some web-sites that we believe youll enjoy, just click the links. We like to honor many other world wide web web-sites on the web, even when they arent linked to us, by linking to them. Below are some webpages really worth checking out. We like to honor lots of other world wide web internet sites on the net, even if they arent linked to us, by linking to them. Beneath are some webpages really worth checking out. We like to honor quite a few other world-wide-web web-sites around the internet, even though they arent linked to us, by linking to them. Underneath are some webpages worth checking out. We prefer to honor quite a few other net web sites on the net, even if they arent linked to us, by linking to them. Below are some webpages worth checking out. That could be the end of this article. Right here youll find some web pages that we believe you will enjoy, just click the links. That is the end of this report. Here you will discover some internet sites that we think youll value, just click the hyperlinks. That could be the end of this article. Right here youll uncover some web pages that we think you will appreciate, just click the links. We prefer to honor numerous other internet web-sites around the web, even though they arent linked to us, by linking to them. Underneath are some webpages worth checking out. Always a huge fan of linking to bloggers that I enjoy but dont get a good deal of link like from. My friend advised I’d maybe like that web page. He / she was 100 % right. This particular article in fact made my personal morning tar instrument. Anyone can not picture exactly how a whole lot time I needed put in just for this data! Many thanks! That will be the finish of this write-up. Here youll locate some sites that we think you will enjoy, just click the links. Hey, You have done an admirable job. I’m going to absolutely reddit this and in my advise to help my buddies. I know they’ll be taken advantage of this excellent website. You may absolutely go to your eagerness inside the artwork you are submitting handicraft. The world desires extra passionate copy writers just like you who are not scared to mention that think. At all times observe a person’s coronary heart. Below youll come across the link to some websites that we consider you need to visit. You might be actually a great site owner.. persian book The web page running pace is usually amazing. It kind of feels that you’ll be carrying out any exceptional key. Also, Your articles usually are masterwork. you could have conducted an excellent method within this subject! My buddy recommended I would possibly in this way site. They had been altogether appropriate.. خرید وی پی اس This article truly manufactured the evening. You should not think about just how a lot occasion I did expended in this facts! Thanks! Pretty portion of written content. I just now located your blog plus in accession capital to say i receive truly enjoyed bill your blog post posts.. خرید اپل ایدی Any way My business is opt-in with your bottles or perhaps I results you obtain admission to regularly promptly. We have find out several outstanding information below.. handicraft Worth book-marking for returning to. I delight the way much try out you place to create any type of fantastic useful web site. That may be the end of this post. Here you will uncover some internet sites that we consider youll enjoy, just click the links. We prefer to honor quite a few other internet internet sites on the web, even though they arent linked to us, by linking to them. Underneath are some webpages really worth checking out. That is the end of this write-up. Right here youll uncover some web pages that we feel youll value, just click the links. Below youll uncover the link to some web sites that we consider you need to visit. That may be the finish of this article. Right here youll uncover some web pages that we assume youll value, just click the hyperlinks. We prefer to honor several other world-wide-web web sites on the net, even when they arent linked to us, by linking to them. Underneath are some webpages worth checking out. That would be the end of this write-up. Right here youll obtain some sites that we assume youll appreciate, just click the hyperlinks. We like to honor numerous other internet web-sites around the web, even though they arent linked to us, by linking to them. Under are some webpages worth checking out. Below youll locate the link to some websites that we consider you should visit. That is the finish of this post. Right here you will obtain some websites that we think youll value, just click the hyperlinks. Below youll uncover the link to some websites that we think you need to visit. That may be the end of this write-up. Right here youll find some websites that we assume you will value, just click the links. Below youll discover the link to some web pages that we consider you’ll want to visit. Below youll obtain the link to some web-sites that we feel it is best to visit. Always a large fan of linking to bloggers that I really like but dont get a whole lot of link really like from. That will be the finish of this write-up. Here you will find some web pages that we assume youll appreciate, just click the hyperlinks. Below youll discover the link to some websites that we think you ought to visit. That could be the end of this write-up. Right here you will find some web pages that we feel youll appreciate, just click the links. We prefer to honor several other net web pages on the web, even if they arent linked to us, by linking to them. Underneath are some webpages really worth checking out. That is the finish of this post. Right here youll uncover some websites that we feel youll enjoy, just click the hyperlinks. Below youll find the link to some web-sites that we consider you need to visit. We prefer to honor a lot of other web websites around the web, even though they arent linked to us, by linking to them. Beneath are some webpages worth checking out. We prefer to honor several other web web pages on the net, even if they arent linked to us, by linking to them. Beneath are some webpages worth checking out. We prefer to honor many other net websites on the net, even if they arent linked to us, by linking to them. Underneath are some webpages worth checking out. That could be the finish of this report. Here youll obtain some websites that we assume youll enjoy, just click the links. We like to honor several other web websites on the net, even though they arent linked to us, by linking to them. Beneath are some webpages really worth checking out. We prefer to honor a lot of other net web sites around the web, even if they arent linked to us, by linking to them. Beneath are some webpages worth checking out. We like to honor many other online internet sites around the net, even if they arent linked to us, by linking to them. Below are some webpages worth checking out. We prefer to honor numerous other net sites on the internet, even if they arent linked to us, by linking to them. Beneath are some webpages worth checking out. Always a huge fan of linking to bloggers that I really like but dont get a good deal of link like from. We prefer to honor a lot of other world wide web internet sites on the web, even if they arent linked to us, by linking to them. Beneath are some webpages really worth checking out. That would be the finish of this report. Here youll obtain some websites that we believe you will enjoy, just click the hyperlinks. We prefer to honor numerous other web internet sites on the web, even when they arent linked to us, by linking to them. Underneath are some webpages worth checking out. Below youll obtain the link to some web pages that we consider you need to visit. We like to honor lots of other web internet sites around the web, even when they arent linked to us, by linking to them. Beneath are some webpages worth checking out. Below youll discover the link to some web-sites that we consider you’ll want to visit. Below youll locate the link to some internet sites that we assume you ought to visit. Always a significant fan of linking to bloggers that I appreciate but dont get a whole lot of link really like from. Below youll locate the link to some websites that we believe you must visit. We prefer to honor many other world-wide-web web-sites around the net, even if they arent linked to us, by linking to them. Under are some webpages really worth checking out. We prefer to honor several other world-wide-web web-sites around the internet, even when they arent linked to us, by linking to them. Under are some webpages really worth checking out. That is the finish of this report. Here you will discover some web pages that we assume youll appreciate, just click the links. That may be the end of this report. Here youll locate some websites that we assume youll appreciate, just click the hyperlinks. That may be the end of this report. Right here youll find some internet sites that we believe you will value, just click the hyperlinks. That will be the finish of this article. Here youll uncover some web pages that we assume youll value, just click the links. We prefer to honor many other world-wide-web sites around the net, even if they arent linked to us, by linking to them. Beneath are some webpages worth checking out. Always a large fan of linking to bloggers that I adore but dont get a lot of link enjoy from. We like to honor lots of other net sites around the internet, even though they arent linked to us, by linking to them. Beneath are some webpages really worth checking out. Below youll discover the link to some web sites that we assume it is best to visit. That will be the end of this report. Here you will obtain some web sites that we assume youll enjoy, just click the hyperlinks. Below youll discover the link to some web pages that we assume you must visit. We prefer to honor many other web websites on the web, even if they arent linked to us, by linking to them. Beneath are some webpages worth checking out. We prefer to honor quite a few other internet web sites on the net, even if they arent linked to us, by linking to them. Below are some webpages worth checking out. Below youll come across the link to some web sites that we feel you must visit. Always a large fan of linking to bloggers that I appreciate but dont get a whole lot of link like from. That is the finish of this report. Here youll locate some internet sites that we believe you will appreciate, just click the links. That will be the finish of this write-up. Here you will uncover some web pages that we feel youll value, just click the hyperlinks. That could be the end of this post. Right here you will find some internet sites that we consider youll appreciate, just click the hyperlinks. We like to honor numerous other world wide web web-sites on the internet, even when they arent linked to us, by linking to them. Under are some webpages worth checking out. We like to honor a lot of other internet web pages around the net, even though they arent linked to us, by linking to them. Underneath are some webpages worth checking out. That is the end of this post. Here youll locate some web sites that we think you will enjoy, just click the links. That may be the finish of this write-up. Here youll come across some sites that we believe you will value, just click the hyperlinks. Below youll locate the link to some sites that we consider it is best to visit. We like to honor several other internet web pages around the web, even if they arent linked to us, by linking to them. Below are some webpages worth checking out. That would be the end of this article. Here youll come across some web sites that we feel you will value, just click the hyperlinks. That will be the end of this post. Right here youll find some websites that we believe you will appreciate, just click the links. That could be the end of this article. Here you will uncover some sites that we assume youll enjoy, just click the hyperlinks. Below youll find the link to some internet sites that we feel you should visit. We prefer to honor lots of other web websites on the internet, even if they arent linked to us, by linking to them. Under are some webpages worth checking out. Always a big fan of linking to bloggers that I appreciate but dont get a great deal of link love from. We prefer to honor quite a few other internet web-sites on the web, even though they arent linked to us, by linking to them. Under are some webpages worth checking out. That will be the end of this write-up. Right here you will come across some sites that we consider youll value, just click the links. We like to honor several other online web pages around the web, even though they arent linked to us, by linking to them. Underneath are some webpages worth checking out. That would be the finish of this post. Here youll come across some web sites that we assume you will value, just click the hyperlinks. That would be the finish of this report. Right here you will locate some web-sites that we believe youll appreciate, just click the links. We prefer to honor quite a few other internet web pages around the internet, even when they arent linked to us, by linking to them. Beneath are some webpages worth checking out. We like to honor lots of other internet web-sites on the internet, even when they arent linked to us, by linking to them. Below are some webpages really worth checking out. That may be the finish of this write-up. Right here you will locate some web-sites that we feel youll enjoy, just click the hyperlinks. We like to honor several other world-wide-web web pages around the internet, even if they arent linked to us, by linking to them. Beneath are some webpages worth checking out. We prefer to honor several other world-wide-web sites around the web, even though they arent linked to us, by linking to them. Below are some webpages really worth checking out. That is the finish of this article. Right here you will obtain some web pages that we feel youll value, just click the links. That could be the finish of this article. Right here youll find some sites that we think you will value, just click the hyperlinks. We prefer to honor a lot of other internet web pages around the net, even if they arent linked to us, by linking to them. Beneath are some webpages worth checking out. That could be the end of this post. Here you will obtain some web pages that we think youll enjoy, just click the links. Always a huge fan of linking to bloggers that I adore but dont get a great deal of link love from. Below youll come across the link to some web-sites that we feel you should visit. Below youll uncover the link to some web pages that we assume you must visit. That could be the end of this write-up. Right here youll uncover some web sites that we feel you will enjoy, just click the hyperlinks. Always a significant fan of linking to bloggers that I love but dont get lots of link appreciate from. That would be the end of this report. Here you will locate some websites that we believe youll enjoy, just click the hyperlinks. We prefer to honor many other online websites around the internet, even when they arent linked to us, by linking to them. Underneath are some webpages really worth checking out. We like to honor a lot of other net sites on the net, even if they arent linked to us, by linking to them. Below are some webpages worth checking out. That could be the finish of this article. Right here youll obtain some sites that we assume you will enjoy, just click the links. Below youll obtain the link to some web pages that we feel you need to visit. We like to honor lots of other online sites around the web, even when they arent linked to us, by linking to them. Under are some webpages really worth checking out. Always a large fan of linking to bloggers that I enjoy but dont get a lot of link appreciate from. Always a massive fan of linking to bloggers that I really like but dont get quite a bit of link appreciate from. That is the end of this write-up. Right here youll come across some web sites that we assume you will value, just click the hyperlinks. That may be the end of this post. Here you will locate some websites that we believe youll value, just click the links. We prefer to honor lots of other world wide web web sites around the net, even though they arent linked to us, by linking to them. Beneath are some webpages really worth checking out. We prefer to honor numerous other net web sites around the internet, even when they arent linked to us, by linking to them. Under are some webpages worth checking out. Always a significant fan of linking to bloggers that I love but dont get quite a bit of link really like from. Below youll find the link to some sites that we assume you’ll want to visit. Always a big fan of linking to bloggers that I appreciate but dont get lots of link really like from. Always a significant fan of linking to bloggers that I adore but dont get quite a bit of link love from. That could be the end of this report. Here youll come across some web-sites that we consider youll appreciate, just click the hyperlinks. We prefer to honor several other internet web sites on the net, even if they arent linked to us, by linking to them. Under are some webpages worth checking out. That would be the finish of this write-up. Right here youll discover some internet sites that we believe you will appreciate, just click the hyperlinks. That is the end of this post. Here youll locate some internet sites that we believe youll appreciate, just click the hyperlinks. That may be the finish of this write-up. Right here youll come across some internet sites that we assume youll value, just click the links. We prefer to honor quite a few other web web-sites around the web, even if they arent linked to us, by linking to them. Underneath are some webpages worth checking out. Always a big fan of linking to bloggers that I really like but dont get a lot of link love from. That would be the end of this write-up. Here youll find some internet sites that we believe you will enjoy, just click the hyperlinks. We like to honor quite a few other net websites on the web, even if they arent linked to us, by linking to them. Beneath are some webpages really worth checking out. We like to honor several other web sites around the web, even when they arent linked to us, by linking to them. Underneath are some webpages really worth checking out. Below youll uncover the link to some internet sites that we feel you must visit. Always a huge fan of linking to bloggers that I appreciate but dont get quite a bit of link really like from. That could be the end of this post. Here youll discover some sites that we assume youll value, just click the hyperlinks. That will be the finish of this article. Right here you will obtain some web sites that we believe youll value, just click the hyperlinks. Below youll discover the link to some internet sites that we consider you ought to visit. Always a major fan of linking to bloggers that I appreciate but dont get a good deal of link enjoy from. That would be the end of this article. Here youll come across some websites that we consider you will appreciate, just click the links. That is the end of this write-up. Here youll obtain some web pages that we assume youll value, just click the links. That would be the end of this post. Right here youll find some web pages that we feel you will enjoy, just click the links. That is the end of this report. Here you will find some internet sites that we assume youll enjoy, just click the hyperlinks. That will be the finish of this write-up. Here youll come across some web pages that we feel you will value, just click the links. That would be the end of this article. Right here youll find some web sites that we consider youll value, just click the links. Below youll come across the link to some sites that we consider you must visit. Always a significant fan of linking to bloggers that I enjoy but dont get lots of link really like from. Always a big fan of linking to bloggers that I enjoy but dont get a good deal of link like from. Below youll obtain the link to some web-sites that we believe you need to visit. Always a huge fan of linking to bloggers that I enjoy but dont get lots of link really like from. That would be the finish of this write-up. Here you will find some sites that we feel youll value, just click the links. That could be the finish of this report. Here youll discover some web-sites that we believe you will appreciate, just click the hyperlinks. We prefer to honor numerous other online internet sites around the web, even though they arent linked to us, by linking to them. Beneath are some webpages worth checking out. We like to honor several other web web-sites around the internet, even though they arent linked to us, by linking to them. Below are some webpages really worth checking out. That is the end of this article. Right here youll locate some websites that we assume you will appreciate, just click the links. That is the end of this write-up. Here youll locate some internet sites that we think youll appreciate, just click the hyperlinks. We like to honor lots of other internet web sites on the net, even if they arent linked to us, by linking to them. Underneath are some webpages really worth checking out. We prefer to honor lots of other world wide web internet sites around the internet, even if they arent linked to us, by linking to them. Underneath are some webpages really worth checking out. That will be the end of this report. Here you will discover some sites that we assume youll enjoy, just click the hyperlinks. We prefer to honor several other web web-sites around the net, even though they arent linked to us, by linking to them. Under are some webpages really worth checking out. That would be the finish of this write-up. Here youll locate some websites that we think you will value, just click the hyperlinks. Below youll discover the link to some web-sites that we believe you should visit. We like to honor lots of other web websites around the internet, even when they arent linked to us, by linking to them. Under are some webpages worth checking out. We prefer to honor numerous other web web sites around the web, even if they arent linked to us, by linking to them. Underneath are some webpages worth checking out. Below youll come across the link to some websites that we consider you ought to visit. Below youll find the link to some sites that we consider you need to visit. We like to honor a lot of other web sites around the web, even if they arent linked to us, by linking to them. Underneath are some webpages really worth checking out. That could be the end of this post. Here you will locate some web sites that we think youll value, just click the links. That may be the end of this report. Right here you will locate some sites that we assume youll enjoy, just click the hyperlinks. That is the end of this post. Here youll uncover some internet sites that we feel youll appreciate, just click the links. We like to honor a lot of other net sites on the internet, even if they arent linked to us, by linking to them. Beneath are some webpages really worth checking out. That is the finish of this report. Here youll find some web-sites that we feel you will enjoy, just click the hyperlinks. That is the finish of this write-up. Here youll find some web sites that we consider youll enjoy, just click the links. That would be the finish of this article. Right here youll uncover some websites that we feel youll enjoy, just click the hyperlinks. We like to honor many other internet websites on the net, even if they arent linked to us, by linking to them. Beneath are some webpages really worth checking out. We like to honor lots of other internet web sites on the internet, even if they arent linked to us, by linking to them. Underneath are some webpages worth checking out. Always a major fan of linking to bloggers that I adore but dont get quite a bit of link like from. We like to honor several other internet internet sites on the web, even when they arent linked to us, by linking to them. Beneath are some webpages worth checking out. That may be the finish of this report. Here youll discover some web-sites that we assume youll enjoy, just click the links. We like to honor several other web web pages on the web, even when they arent linked to us, by linking to them. Below are some webpages really worth checking out. Always a big fan of linking to bloggers that I adore but dont get a good deal of link like from. Always a major fan of linking to bloggers that I like but dont get a good deal of link appreciate from. That is the finish of this report. Right here youll locate some web-sites that we consider you will value, just click the links. We prefer to honor a lot of other internet websites around the web, even though they arent linked to us, by linking to them. Under are some webpages worth checking out. We prefer to honor quite a few other internet sites on the internet, even though they arent linked to us, by linking to them. Underneath are some webpages worth checking out. Below youll uncover the link to some web-sites that we feel you ought to visit. Below youll obtain the link to some internet sites that we think you’ll want to visit. We like to honor several other world-wide-web sites on the web, even though they arent linked to us, by linking to them. Under are some webpages worth checking out. We like to honor quite a few other internet internet sites on the internet, even when they arent linked to us, by linking to them. Underneath are some webpages worth checking out. We like to honor numerous other net web-sites around the internet, even if they arent linked to us, by linking to them. Under are some webpages really worth checking out. We prefer to honor lots of other web websites around the net, even when they arent linked to us, by linking to them. Beneath are some webpages really worth checking out. We like to honor many other internet web-sites around the web, even if they arent linked to us, by linking to them. Below are some webpages worth checking out. That could be the end of this post. Right here you will uncover some web pages that we think youll enjoy, just click the links. We prefer to honor several other net web sites around the web, even when they arent linked to us, by linking to them. Under are some webpages really worth checking out. Below youll obtain the link to some websites that we assume you’ll want to visit. We prefer to honor many other world-wide-web web sites on the web, even when they arent linked to us, by linking to them. Under are some webpages really worth checking out. We prefer to honor quite a few other web sites on the web, even though they arent linked to us, by linking to them. Under are some webpages really worth checking out. We prefer to honor numerous other web sites around the internet, even if they arent linked to us, by linking to them. Under are some webpages worth checking out. Always a massive fan of linking to bloggers that I appreciate but dont get a great deal of link really like from. Below youll come across the link to some web-sites that we feel you ought to visit. We prefer to honor quite a few other online websites around the web, even when they arent linked to us, by linking to them. Under are some webpages really worth checking out. We prefer to honor a lot of other world-wide-web internet sites around the internet, even when they arent linked to us, by linking to them. Below are some webpages worth checking out. Below youll find the link to some web pages that we think you ought to visit. We prefer to honor quite a few other online web pages on the internet, even when they arent linked to us, by linking to them. Underneath are some webpages really worth checking out. We prefer to honor several other web internet sites around the internet, even when they arent linked to us, by linking to them. Under are some webpages worth checking out. We like to honor a lot of other world-wide-web web-sites on the internet, even if they arent linked to us, by linking to them. Underneath are some webpages worth checking out. We prefer to honor lots of other world-wide-web web pages around the web, even though they arent linked to us, by linking to them. Beneath are some webpages really worth checking out. That could be the finish of this report. Right here youll locate some websites that we consider youll value, just click the hyperlinks. That would be the finish of this write-up. Right here you will locate some web pages that we assume youll appreciate, just click the links. That is the end of this report. Here you will uncover some websites that we think youll enjoy, just click the links. That may be the end of this write-up. Right here youll locate some websites that we consider you will value, just click the hyperlinks. Below youll discover the link to some websites that we consider you need to visit. We like to honor numerous other online web-sites on the web, even when they arent linked to us, by linking to them. Under are some webpages really worth checking out. We like to honor numerous other internet internet sites on the internet, even if they arent linked to us, by linking to them. Below are some webpages worth checking out. We like to honor lots of other web sites around the net, even though they arent linked to us, by linking to them. Below are some webpages worth checking out. We like to honor many other world wide web web-sites around the internet, even when they arent linked to us, by linking to them. Underneath are some webpages worth checking out. That could be the finish of this report. Right here youll come across some web sites that we believe you will enjoy, just click the links. That may be the finish of this post. Right here youll find some websites that we feel youll appreciate, just click the hyperlinks. Below youll obtain the link to some web sites that we consider it is best to visit. We prefer to honor lots of other internet web-sites around the net, even if they arent linked to us, by linking to them. Underneath are some webpages worth checking out. We prefer to honor several other web websites around the web, even if they arent linked to us, by linking to them. Below are some webpages really worth checking out. Below youll discover the link to some web pages that we believe you need to visit. Always a big fan of linking to bloggers that I like but dont get a whole lot of link appreciate from. That will be the end of this write-up. Here you will uncover some sites that we believe youll enjoy, just click the hyperlinks. That may be the finish of this article. Right here you will uncover some websites that we think youll value, just click the hyperlinks. We like to honor numerous other net sites around the net, even if they arent linked to us, by linking to them. Under are some webpages really worth checking out. Below youll find the link to some web pages that we feel you ought to visit. Always a big fan of linking to bloggers that I appreciate but dont get quite a bit of link appreciate from. That could be the end of this write-up. Here youll uncover some internet sites that we assume youll appreciate, just click the hyperlinks. We like to honor many other internet web pages around the internet, even when they arent linked to us, by linking to them. Below are some webpages really worth checking out. Below youll obtain the link to some websites that we feel you ought to visit. Below youll come across the link to some web-sites that we believe you ought to visit. We prefer to honor several other internet sites on the web, even if they arent linked to us, by linking to them. Beneath are some webpages really worth checking out. Below youll come across the link to some web pages that we think you’ll want to visit. That could be the finish of this write-up. Here you will obtain some web pages that we believe youll appreciate, just click the links. Always a big fan of linking to bloggers that I love but dont get lots of link like from. That will be the end of this post. Here youll come across some web sites that we assume youll appreciate, just click the hyperlinks. Always a massive fan of linking to bloggers that I adore but dont get quite a bit of link like from. That may be the end of this report. Here youll come across some sites that we consider youll value, just click the links. We like to honor quite a few other online internet sites on the net, even when they arent linked to us, by linking to them. Under are some webpages worth checking out. We like to honor lots of other world wide web internet sites on the web, even when they arent linked to us, by linking to them. Underneath are some webpages worth checking out. We like to honor several other world wide web web sites around the internet, even when they arent linked to us, by linking to them. Beneath are some webpages worth checking out. Always a huge fan of linking to bloggers that I adore but dont get a great deal of link like from. Below youll uncover the link to some websites that we feel you need to visit. That is the end of this article. Here youll discover some web sites that we assume youll appreciate, just click the hyperlinks. We prefer to honor quite a few other online web-sites on the net, even when they arent linked to us, by linking to them. Underneath are some webpages really worth checking out. We like to honor several other internet sites on the net, even if they arent linked to us, by linking to them. Beneath are some webpages really worth checking out. We prefer to honor several other web sites on the net, even if they arent linked to us, by linking to them. Beneath are some webpages really worth checking out. We like to honor lots of other world-wide-web websites on the net, even though they arent linked to us, by linking to them. Underneath are some webpages really worth checking out. Below youll uncover the link to some web sites that we think you’ll want to visit. Below youll discover the link to some sites that we believe you need to visit. Below youll come across the link to some web sites that we feel you’ll want to visit. That is the end of this write-up. Right here youll discover some web sites that we assume you will enjoy, just click the links. We prefer to honor numerous other world-wide-web web pages around the web, even if they arent linked to us, by linking to them. Under are some webpages really worth checking out. Always a large fan of linking to bloggers that I like but dont get a good deal of link really like from. That is the end of this write-up. Here you will locate some internet sites that we feel youll value, just click the links. That is the finish of this write-up. Here youll locate some web pages that we think you will appreciate, just click the links. That is the end of this article. Here youll come across some web-sites that we consider you will enjoy, just click the hyperlinks. That will be the end of this post. Here youll find some web-sites that we assume you will value, just click the hyperlinks. That will be the finish of this write-up. Here youll locate some web-sites that we assume youll enjoy, just click the links. We like to honor numerous other web websites on the internet, even though they arent linked to us, by linking to them. Beneath are some webpages really worth checking out. We prefer to honor numerous other online internet sites on the internet, even though they arent linked to us, by linking to them. Underneath are some webpages worth checking out. That may be the end of this write-up. Right here you will obtain some sites that we consider youll appreciate, just click the links. Always a massive fan of linking to bloggers that I adore but dont get a good deal of link adore from. We prefer to honor numerous other world wide web web-sites on the net, even if they arent linked to us, by linking to them. Below are some webpages really worth checking out. That may be the finish of this article. Right here youll find some internet sites that we believe youll enjoy, just click the links. We like to honor quite a few other web websites on the web, even though they arent linked to us, by linking to them. Underneath are some webpages worth checking out. Below youll uncover the link to some sites that we feel you must visit. Always a major fan of linking to bloggers that I enjoy but dont get a whole lot of link like from. That is the end of this write-up. Right here youll find some internet sites that we think youll appreciate, just click the links. That is the finish of this article. Right here youll uncover some internet sites that we consider youll value, just click the links. That is the end of this write-up. Here youll find some websites that we think youll value, just click the links. We like to honor numerous other world wide web sites on the web, even if they arent linked to us, by linking to them. Below are some webpages worth checking out. We like to honor quite a few other net internet sites around the net, even though they arent linked to us, by linking to them. Under are some webpages worth checking out. That would be the end of this article. Right here youll find some web pages that we believe youll appreciate, just click the hyperlinks. That will be the finish of this report. Here youll locate some sites that we believe you will value, just click the hyperlinks. Always a big fan of linking to bloggers that I really like but dont get a great deal of link appreciate from. That is the finish of this report. Here youll come across some web sites that we think youll value, just click the hyperlinks. That will be the finish of this report. Right here youll discover some web sites that we feel you will value, just click the hyperlinks. Below youll discover the link to some websites that we consider you’ll want to visit. Always a significant fan of linking to bloggers that I appreciate but dont get a lot of link love from. Always a major fan of linking to bloggers that I enjoy but dont get lots of link like from. We like to honor lots of other internet web pages on the net, even if they arent linked to us, by linking to them. Below are some webpages really worth checking out. That would be the finish of this report. Right here you will uncover some web sites that we feel youll appreciate, just click the hyperlinks. That may be the finish of this report. Right here you will find some internet sites that we assume youll appreciate, just click the hyperlinks. That will be the finish of this post. Here youll find some sites that we assume youll enjoy, just click the hyperlinks. That will be the finish of this write-up. Right here you will locate some websites that we think youll enjoy, just click the hyperlinks. That would be the finish of this write-up. Here you will find some sites that we believe youll value, just click the links. We like to honor many other web internet sites around the web, even if they arent linked to us, by linking to them. Under are some webpages really worth checking out. We like to honor several other net web-sites around the net, even if they arent linked to us, by linking to them. Underneath are some webpages really worth checking out. That may be the finish of this write-up. Right here you will find some web sites that we assume youll enjoy, just click the hyperlinks. We prefer to honor lots of other web web sites on the internet, even if they arent linked to us, by linking to them. Below are some webpages worth checking out. That will be the finish of this report. Here youll discover some websites that we consider you will enjoy, just click the hyperlinks. That would be the finish of this write-up. Here youll uncover some web-sites that we consider youll value, just click the links. Always a large fan of linking to bloggers that I really like but dont get a whole lot of link enjoy from. We like to honor several other web web-sites on the internet, even when they arent linked to us, by linking to them. Below are some webpages worth checking out. Below youll find the link to some web sites that we feel you ought to visit. That is the end of this article. Right here you will come across some sites that we think youll enjoy, just click the hyperlinks. We like to honor lots of other web web-sites on the web, even if they arent linked to us, by linking to them. Below are some webpages worth checking out. We like to honor lots of other world-wide-web internet sites on the web, even when they arent linked to us, by linking to them. Underneath are some webpages really worth checking out.